On Jan. 2, 2018, Mayor Frank G. Jackson took the oath of office for his historic fourth term – which will make him the City of Cleveland’s longest serving Mayor. During his time in office, Mayor Jackson has been an advocate for building equity and opportunity for all Clevelanders in all neighborhoods. 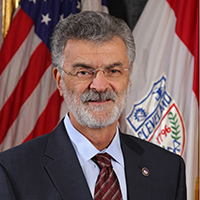 Mayor Jackson is a lifelong resident of the Central Neighborhood where he began his career in elected office as its City Councilman and, later, City Council President. He is a graduate of Cleveland Public Schools, Cuyahoga Community College and Cleveland State University – the latter from which he earned his bachelor’s, master’s and law degree. He began his public service career as an Assistant City Prosecutor in the Cleveland Municipal Court Clerk’s Office. Advancing Cleveland’s Downtown Lakefront Development Plan to encourage 3.5 million square feet in new development that encourages recreation, entertainment commercial maritime activity and economic development.